I love seeing Christians share their ideas and talents with the broader church. I just don't think this happens often enough. Right here in Sydney, Calum Henderson has turned his expertise in games for groups into an app that will be a great resource for youth leaders everywhere. 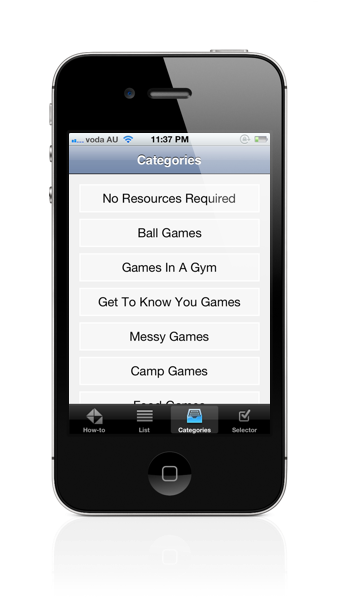 Group Games contains over 100 games (and growing), available at your fingertips on an iPhone, iPad or iPod Touch. Calum's made it easy to find games in a couple of different ways. You can search by category (e.g. messy games, get-to-know-you games, no resources required, etc.). You can also narrow down your options by selecting the size of your group and the amount of available time. I'm no longer serving in youth ministry, but this would have been invaluable in the past. I can remember many a Friday night or planning for a camp where this app would have come in handy! You can find out more online, or purchase (currently on sale for $0.99) at the App Store. We're giving away 5 free copies of this app. To throw your hat in the ring, simply comment below, and 5 winners will be chosen at random.